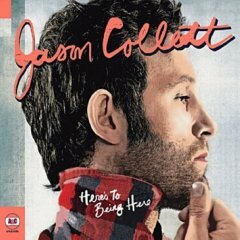 The cruel irony here is that most people recognize Jason Collett from his tenure with Broken Social Scene rather than the material he’s done on his own. So those looking for a taste of the Scene’s bombast and indie rock leanings may be taken aback by Collett’s everyday persona of stripped-down Americana that’s all over his fourth solo disc Here’s To Being Here. So prepare yourself for an album full of rustic charms, plainly delivered under an obligatory Dylanesque phrasing. And don’t expect a lot of them to be easily recalled after you’ve spent an hour or two away from them. Most of the song structures follow the same guitar/bass/drum patterns, occasionally including a piano and, even more frequently, implementing an acoustic guitar for more authentic approach. As organic as it all seems, there’s something very illegitimate about most of the material. Collett, who hails from Toronto, may try hard to sound rural, but upon closer examination of his lyrical content, there is very little that he has in common with the salt of the earth. So while I’m thankful that he hasn’t donned some bib overalls and thrown a Massey-Ferguson hat on his head to legitimize the alt-country leanings, it’s obvious that the closest he’s come to sounds he’s delivering is the weekend farmer’s market in Toronto. “Charlyn, Angel Of Kensington” works well at trying to distance itself from the rest of the tracks, with a Latin-tinged rhythm and subtle melodica, but it’s too short lived as the laid-back tilling come quickly after this island getaway. Here’s To Being Here isn’t a bad album; it’s just another one of those alt-country releases that shows up nearly every month with competent execution and a justifiable attempt for your attention. The truth is, there’s nothing on it that makes it rise above the rest of the pack, and in that already crowded genre, that’s something that Collett really needs to focus on. Previous PostUMG Censors BYOPNext PostFull Album Streams: Gnarls, Heads, 52s, JAMC, etc.